In the US alone there are over 40,000 registered people who have had an amputation of a hand or complete arm. There are many more who are missing whole or partial hands due to a congenital issue, (they were born with one or both hands). Worldwide the number of children (and adults) with either one or both hands missing is in the 100's of thousands. There are many children in war-ravaged areas that have lost hands and feet due to horrific trauma. The cost for a prosthetic hand is prohibitively expensive for most; especially when you look at disadvantaged socio-economic segments of the US and around the world. Most are left with the pragmatic conclusion that they will not be able to afford the $5,000-$20,000 needed for the average prosthetic limb. The loss of one or both hands severely limits the child's ability to interact with their environment, and can have devastating effects on their social interactions and esteem. The question is, "how can we help more kids get the prosthetic hands they need and help remove some of the barriers they have to happy productive lives"? With the advent of 3d printing technologies, the ability for someone to manufacture, assemble and deliver a workable prosthetic has opened a wide range of possibilities and opportunities for kids who need a hand. The designs themselves were developed by groups of volunteers and are constantly being refined and augmented to make better and more efficient prosthetics. What would normally cost $5,000 - $20,000, can now be produced for only $50 to $300 each depending on the complexity and features of the new prosthetic. While these lower cost alternatives may not offer the complete features of their more expensive counterparts, a solid workable prosthetic is far superior to no option at all. I work in the Healthcare industry in Arizona and I see many kids who are in need of a new hand. Without this new technology, and the great volunteer work of engineers and fabricators, these kids would otherwise never be able to get a new hand. I started building hands for kids about a year ago. The look on their faces when they get their hand(s), and the new freedoms it offers them, is enough to melt even the coldest of hearts. I have worked with many kids over this year, and the more I do, the more demand there is. I have begun to expand the work I do to help kids all over the world and started a non-profit called Aperta Manus (Latin for open hands - apertamanus.org). I have been working with people all over to gather more resources and funding to expand the amount of kids we can help. There are other organizations as well such as E-nabling the Future and Limbitless who have a large cadre of volunteer engineers and fabricators that are working on newer and more efficient designs. Aperta Manus is all about getting kids the hands they need. We focus on 3 designs that are tested to work. 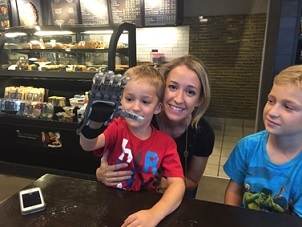 One is a full hand replacement for a child that retains a workable wrist, the second is a more complex hand/arm for kids that have retained an elbow but no longer have a wrist, and the final design, which is in development and testing, is a myoelectric arm that uses sensors on the muscles to open and close the hand with electric motors. The myoelectric arm is for kids with complete or near complete amputations, where there is no wrist or elbow left. Included with this article are some pictures from the latest hand that was delivered to a small boy named Taylor who has not had a right hand since birth. The joy that both he and his family had the day I was able to deliver his new hand was nearly overwhelming. It is kids like Taylor, both here in the US and around the world that drives me to be a better person and to do more for as many as I can. We are currently raising funds to buy additional equipment and supplies so we can serve more kids. Each hand takes about 40 hours of printing time on the 3d printer, plus 5-10 hours of assembly (for the most basic design). The Myoelectric arm will take over 100 hours to print all the parts plus about 40-60 hours of assembly once the design is perfected. If we can get one or more additional printers we can build the hands faster and get them to the kids quicker. We have started an outreach to places like Syria, Iraq, Afghanistan, Nigeria, Sudan, and many other locations ravaged by war and civil unrest. Often the innocent; children in particular, are the first to suffer in areas of high violence. The road will be hard and long as we work through the logistics of contact and ensuring that the hands make it to the children. We will be working on a concerted program to setup up contacts in each region who can get the word out, find the kids in need and help make sure that the prosthetics make it to them. The often systemic corruption of the economic systems of some of these areas, may make helping the children challenging. It is my belief that this work is so important that the effort is well worth it. I have often thought that the places life sometimes takes us is both unexpected and wonderful. 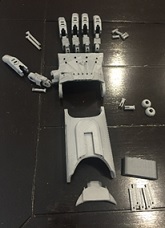 If you had asked me 10 years ago if I thought I would be printing out prosthetic hands for kids on a magical device that creates real objects in 3 dimensions, from a computer file, I probably would have thought you had read too much science fiction. The fact that technology and people have come together, to make all this all possible, is nothing short of magical.